As another autumn rolled by, it was time for another research cruise into the northern Gulf of Mexico for sediment trap research. As I've blogged before, we collaborate with the USGS St. Petersburg Marine Science Center and try to help out with their long-running sediment trap program whenever we can. The sediment trap is a device placed underwater between the sea surface and seafloor that captures pelagic sedimentation (any biological/sedimentological material produced above it, that drifts into the device and gets 'trapped'). The trap has several cups where one cup is open at any time and collects material for two-to-four weeks, after which it closes and another cup is opened. Every six to ten months (depending on how it is programmed), we have to go out to where the trap is moored, retrieve it by releasing its anchor, collect all the previous samples, perform routine maintenance, and redeploy the trap with new cups. The last sediment trap cruise I was on (March '15) proved to be quite an ill-fated mission: the trap failed to come up to the surface after the signal was sent to release its anchor (after several tries)! This not only meant that the device was lost, either tangled up at the bottom of the ocean somewhere or drifted off into some foreign land (most likely the latter), but that our last 10 months of samples were lost! Such is the mercurial nature of observational field research. Luckily, USGS scientists Julie Richey and Caitlin Reynolds managed to procure a new sediment trap! The purpose of this mid-November trip was to deploy the new sediment trap in the same location as the last one. Our motley crew, apart from the usual suspects of myself, Julie, Caitlin, and the illustrious Eric Tappa from USC, included Eric's student Chris, and graduate students Natasha and Allison from our lab. We were to sail, as usual, on the RV Pelican, out of LUMCON at Cocodrie, Louisiana. However, weather had other plans for us. As is the case with field work, rigid plans solidified months ago, can vaporize instantly: due to weather, the RV Pelican would be severely delayed in coming back to Cocodrie such that our schedule (flights et al) couldn't be accommodated. Instead we had to go to Gulfport, MS to board the RV Point Sur - an equally capable vessel (if not more - it had just been to Antarctica some time ago!) On the way back though, to catch our flights, we would be dropped back in Cocodrie. This being the case, we set sail around 5PM on the 18th of November from Gulfport. Coincidentally, on the flight from Austin to Dallas, I was seated (by random chance) next to chemical oceanographer Jessica Fitzsimmons, who had also sailed on the Point Sur! From Dallas, Natasha, Allison, and I took a flight to NOLA, from where we drove out to Gulfport. Though the weather in Gulfport was dreary the entire day, not really helping the city's rough look, the clouds paved way for a brilliant sunset as we made our ~22 hr journey to the trap location. Deploying the trap is not the most tedious job out at sea. However, rough weather can complicate things, and every step you take has to be an extremely careful one. This being the case, Eric, who's had plenty of experience with these conditions and instruments, guided us (and the crew) through a safe and successful deployment. All of us watched for the two buoys to plop down beneath the sea-surface, but the 10-12 ft of swell and the intermittent rain prevented us from identifying the exact moment. 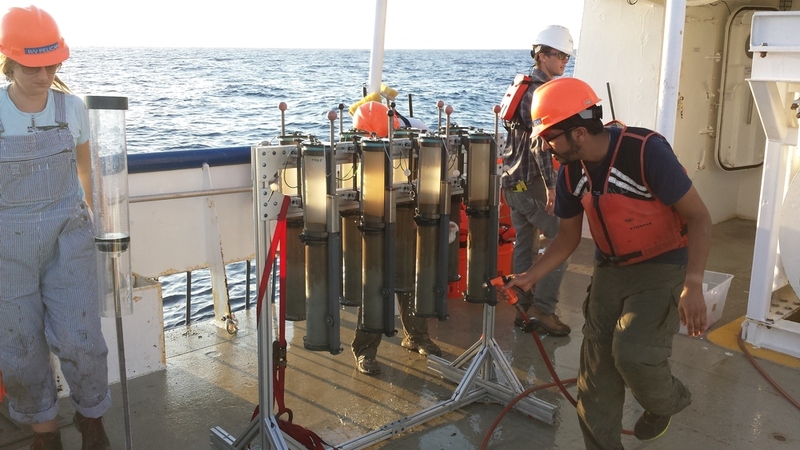 Generally, when we were at site, we also make measurements about the salinity, temperature, and oxygen content of the seawater with a CTD, that also collects waters at different depths. In this process, we realized that we were actually atop a warm-core eddy! This was quite exciting, as it was my first time (I study these systems) being in one, and accordingly, the water temperature was a sizzling 27ºC in November. Amidst a modest yet uncomfortable swell, we made it back to Cocodrie early Friday morning, after spending our second night on the Point Sur. The next cruise to collect all these biweekly-to-monthly cup samples that will be collected by the new sediment trap will be in May. Hopefully, we will get to do some good science with these samples! Last week I was out in the Gulf of Mexico aboard the R/V Pelican for a short little research cruise. Our main intent was to find and redeploy a long-running sediment trap. A sediment trap is an instrument used in oceanographic studies to "trap" sediment formed in the column of water above it. They are extremely useful in quantifying fluxes of marine sediment and in constraining the variability in the production of sediment over time. Mainly, we were interested in quantifying the flux of planktic foraminifera: which foram species grow throughout the year; which species prefer warmer/cooler waters; how accurately their shell chemistry reflect environmental conditions (temperature, salinity) etc. In essence, we are trying to ground-truth the variability we observe in the chemistry of the forams preserved in marine sediment cores to reconstruct ancient water conditions (down-core variability). We can use the chemistry of the shells obtained from the sediment trap and utilize known, instrumental temperature and salinity conditions to build transfer functions for ancient, downcore chemical variations in the shells. Remember, these planktic forams live in the upper column of the ocean and build their shell with chemistry dependent on the environmental conditions during which they grew. After they die, the shells fall down towards the seafloor. Our sediment trap catches these shells and preserves them in cups. The trap is programmed to automatically close a cup every 7 or 14 days and subsequently, open a new one. As the cups get filled over a couple of months, we need to go out to sea, retrieve the trap, put in new cups, perform routine maintenance and redeploy the instrument. My journey started with a flight to St. Petersburg, Florida. Our lab collaborates extensively with the USGS Coastal and Marine Science Center located in St. Pete. Here, I was invited to give a talk on my master's work on single forams by Julie Richey, who studied the Little Ice Age and Medieval Climate Anomaly in the Gulf of Mexico for her PhD work, and now overlooks the center's paleoceanography program. St. Pete is a cool little town and I greatly enjoyed chatting with the folks at USF and USGS. After packing all the equipment and material needed for our research cruise, thanks to the meticulous work of Caitlin Reynolds (a USGS co-author on my AGU presentation who has made the sediment trap "her baby"), we were off to New Orleans, Louisiana - a ~11 hr drive! We stayed overnight at NOLA and picked up more material for the cruise from Brad Rosenheim's lab at Tulane University. Brad's recent Master's graduate, Matt Pendergraft (who has an excellent paper and video abstract out), would join us for the cruise. Next, we had to drive to LUMCON (Louisiana Universities Marine Consortium) at Cocodrie, LA with all our equipment to set sail on the Pelican. At around 7PM on Thursday, the 21st of November, we were off! It took around 12 hrs for us to get to the sediment trap site. Fortunately the weather was great and the seas were calm. After we reached the vicinity of where the trap was deployed last (thanks to GPS) we sent out an acoustic ping to make sure it was nearby. Thankfully, we "heard" the sed. trap ping back. The sediment trap is maintained at a depth of ~700 m by two strategically chosen buoys that give it buoyancy and an anchor that holds it down. The anchor is attached to the sediment trap via an acoustic release. At the site, we send out a signal to the release to detach itself from the anchor, thereby enabling the buoys to push the trap to the surface ocean. Seeing the buoys surface is a big relief! The sediment trap setup has survived for six months without going awry! Next, we pick up the sediment trap, install new cups, perform maintenance, redeploy it with a new anchor, and hope that it survives until we're back. While we were out there, Julie and I wanted to get some core-top material (the topmost portion of the sea-floor). Core-tops are another means through which paleoceanographers can ground-truth down-core variability. For this operation, we turned to a multicorer (here's a neat underwater video). After getting successful core recovery (a total of 4 casts), we had to extrude and sub-sample all the core material at 0.5cm/sample (conventional sampling resolution). Mind you, there were 8 multicores per cast, each at ~45cm which equates to a lot of extruding! The journey back to Cocodrie was largely uneventful and much to our liking, the seas stayed calm. It was almost a year since I had been out to sea and going back only reminded me how much I like it out there!